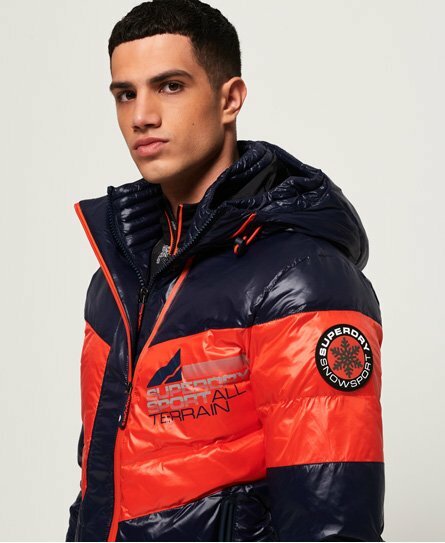 Superdry men’s Snow terrain Down puffer jacket. The Snow terrain puffer jacket is filled with a 90/10 premium duck down filling and a very high fill power rating, providing fantastic insulation and perfect for apres skiing. This jacket has been designed with a detachable snow skirt, elasticated cuffs and a two zip fastening to keep you dry. This jacket also have two coated zips with hidden zips on the inside and a ski pass holder on the sleeve. The snow terrain puffer jacket has been finished with a Superdry badge above the hem on the reverse of the jacket, Superdry branded zip pulls and a Superdry Snowsport badge on the sleeve.